Another of my occasional series about books from the past. Last week I went to a conference in Bristol, a biannual affair discussing a wide range of mostly twentieth-century children’s books. I enjoyed hearing talks on writers like Rosemary Sutcliff, Noel Streatfeild and Geoffrey Trease, as well as the Chalet School, etc. One of the highlights is the book sale. 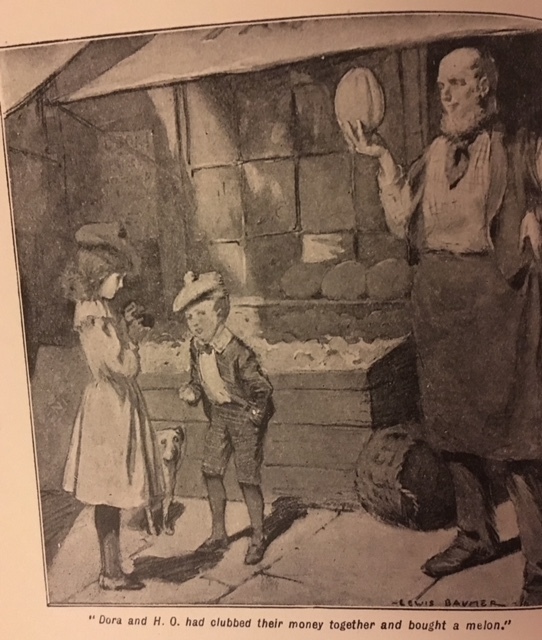 Specialist dealers and delegates alike bring hundreds of children’s books – the rare, the eye-wateringly expensive and occasionally the shabby old friend that you have to buy because it’s exactly the edition they had in the Cregagh Library in 1979. I told myself I had to be ruthless. I’d had a huge clear-out, and I’m not a person of great means. 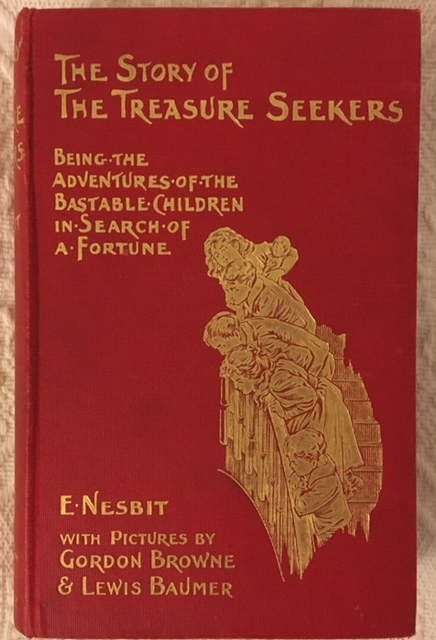 But I couldn’t pass this by.The Story of the Treasure Seekers, along with The Railway Children, was always my favourite E. Nesbit. (I have always preferred my stories without magic, where possible.) This copy, dated 1907, is not a first (the book was published in 1899) but it's certainly the oldest copy I have seen. As you can see, it's fine and clean, a vibrant red with gilt tooling. An object of beauty. My own old copy was a 1960s Puffin paperback from a jumble sale, charming because it was my own, but not to be compared to this beauty. My fiftieth birthday is a fortnight away; I decided to treat myself. This isn’t about the humour and heart of the story, though if you are unfamiliar with the fortunes of the house of Bastable, I suggest you remedy that forthwith. It’s about the book itself. 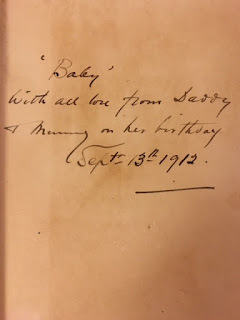 It’s dedicated to‘Baby’, with all love from Daddy & Mummy on her birthday, Sept 13th, 1912. 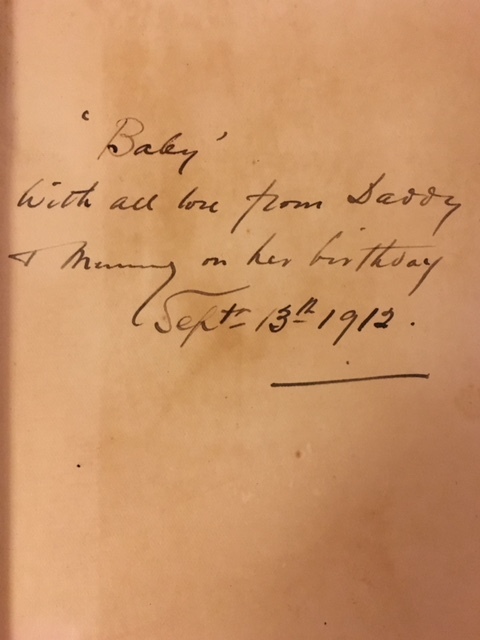 It was customary then for children to be known as Baby for the first year or so of life, especially in larger families, but I don’t know if ‘Baby’ received this book as an infant – it doesn’t say which birthday, so it might indeed be her birth day – or as an older child. In which case, how embarrassing still to be known as ‘Baby’ -- she might have been the soppy sort of child the Bastables would have despised. 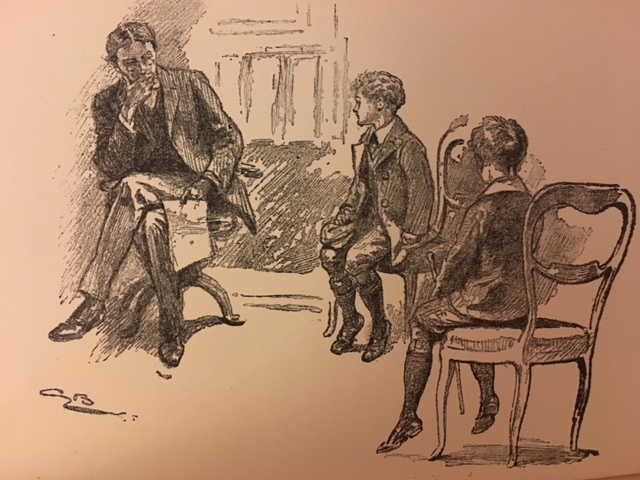 The book had been around for 13 years by 1912: I like to think it was a childhood favourite of 'Daddy' or 'Mummy', and they were impatient to pass it on to their own child. But ‘Baby’ never read The Story of the Treasure Seekers; I am sure of it. Not this copy anyway. It’s very, very clean. Suspiciously so for a child’s book that is now 111 years old. Perhaps she grew up not to care much for reading. If, as I suspect, she was given the book as an infant, to ‘grow into’, she would have been ready to read it around 1922. Maybe she preferred Angela Brazil or the first of the Dimsie books. Or perhaps, as she would have been six in 1918, she was one of the 50 million people who died in the great flu pandemic. Or her parents did, and she was orphaned, sent away perhaps without her books. We will never know. And whatever happened to ‘Baby’, this book, carefully chosen by her parents, has outlived them all. I don’t know where it has been through the whole of the twentieth century, but I know where it’s going to be for the rest of my life. And it may not stay quite so pristine because it is going to be taken down, and loved, and most importantly read. What a lucky find, Sheena - and how lucky that it was you, who loved the books so much, who found it! 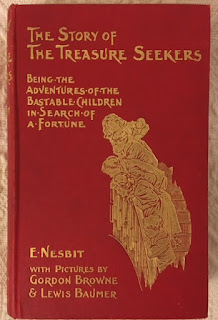 (I'm also a great fan of Nesbit's books.) As you say, the inscription poses more questions than it answers - maybe it will inspire a story in itself? Fascinating post. Many thanks. You have no idea how envious I am!